Invasi Swedish Grinding Style memang tidak mengecewakan agresi-nya sejak UK Grindcore lebih dulu menyerang masih dengan segala kebenciannya, dan Kemunculan Band seperti Nasum telah membawa pengaruh yang Signifikan terhadap generasi Grinding Beat selanjutnya. dengan Raw Sound Swedish Sound yang diadopsi dari karakter Band Death Metal Pendahulunya menjadi Karakter yang terasa Komparatif disetiap sentuhan Band asal Jakarta Timur ini. the d-beat punk influence in their songs, as well as the band’s tasteful use of breakdowns. Not chugga-chugga breakdowns, but ones that really act as a powerful counterpoint and build up, This album is definitely a shining moment for modern grindcore, and should be a staple in any grind fan’s listening habits. Rasanya seperti Nasum Telah bereinkarnasi di Indonesia begitu menikmati 18 Extra Track Berisik yang dirilis Kolektif beberapa label Grinkor menjadi jembatan pelumat Obsesi Ketidak puasan mereka dengan Penuh kebencian Musikal ! Serangan demi serangan seakan langsung memenuhi Ruang Dengar kita dengan Suguhan Grinding Musick yang Full Berisik. Swedish sound yang begitu kental memang menjadi sentuhan paling kuat untuk pesona Album " Untrusted Government Effect " ini. this is a very necessary component to the collection of any fan Swedish Grindcore Sound or modern grind in general. Penulisan lagu yang asal berisik memang menambah Kesan Asyik, Ketukan Drumming yang powerfully tersaji lebih Natural sekali disetiap pukulannya, The drumming rangings from simple patterns to super fast poundings. The instruments mesh together amazingly to create one hell of a grinding sound. Sehingga Komposisi yang ditawarkan disini lebih mendasar apalagi didukung dengan sound yang Lebih baik, Ga heran memang jika ini adalah Produksi Album Grindcore yang gw rekomendasikan sekali untuk kalian penikmat Irama Berisik yang ga asal Berisik. Karena setiap Track yang Gw nikmati gw menemukan esensi Kontruksional Harmonisasi penuh perhitungan Catchy listening tempo dan Bar Riffing-nya. JIGSAW menambah kembali Perbendaharaan Grindcore band tanah air dengan eksistensi berbahaya-nya. The only emotive quality one could seemingly pull from the wreckage that is grindcore, is the fact that it’s going to be an aggressive assault on the sense. Kind of like a smash and grab raid are definately the epitome of great grindcore. Destruksi Gergaji Penggerinda Otak dengan Letupan Harmonisasi Kasar yang Menggerus telinga ! 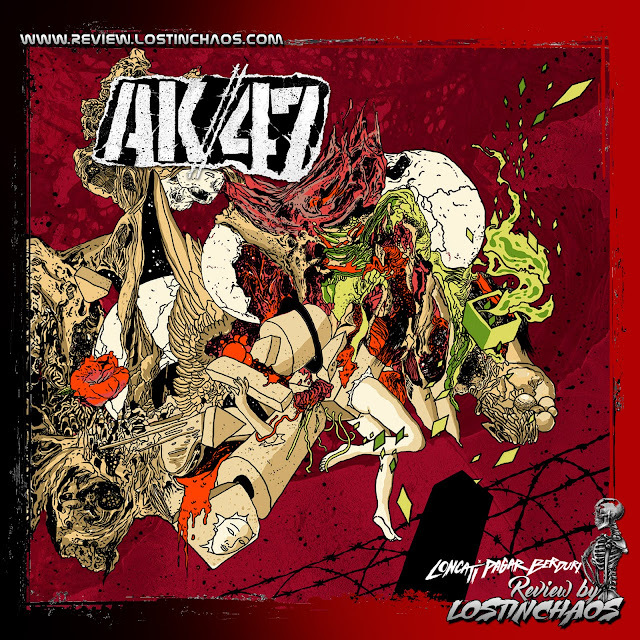 To call this definitive grindcore would not be a misnomer, as it fulfills really all of the genre's descriptive elements but never feels particularly trite. Maybe it's the apocalyptic atmosphere, or perhaps they're MORE brutal and faster than other grindcore bands. It could also be because I enjoy the grindcore aesthetic. Especially For Diehard Fans Of Nasum, GREAT GRINDING ASSAULT HAS COME !!!! Swedish Grinding invasion Style does not disappoint his aggression since UK Grindcore first strike still with all the hatred, and Emerging Bands like Nasum has brought significant influence on the next generation of Grinding Beat. the Swedish Raw Sound adopted from character Death Metal Band predecessor into each character feels Comparative Band from East Jakarta touch this. the d-beat punk influence in Reviews their songs, as well as the band's tasteful use of breakdowns. Not chugga-chugga breakdowns, but ones that really act as a powerful counterpoint and build up, This album is definitely a shining moment for modern grindcore, and should be a staple in any fan's listening habits grind. It feels like Nasum has been reincarnated in Indonesia so enjoy 18 Extra Track Noisy released Collective several labels Grinkor be grinding bridge Obsession their dissatisfaction with Full hatred Musical! Attack after attack as if directly meet our listening room with the Full Treat Noisy Grinding Musick. Swedish sound is so thick it became the most powerful touch of charm Album "Untrusted Government Effect" is. this is a very Necessary component to the collection of any fan of modern Swedish grindcore Sound or grind in general. Writing original songs noisy indeed add Impression Fun, Beats Drumming which powerfully presented more Natural once every shot, the drumming rangings from simple patterns to super fast poundings. The instruments mesh together amazingly to create one hell of a grinding sound. So that the composition is offered here is more fundamental especially supported by sound better, Ga surprised indeed if this is Grindcore Album Production gw connoisseurs recommend all to you guys No Rhythm Noisy Noisy origin. Because every track that i find the essence Constructed enjoy full harmonization Catchy calculation listening tempo and Bar riffing her. 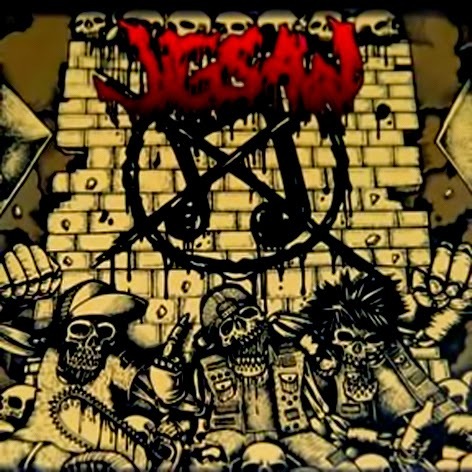 JIGSAW add Treasury Grindcore band back home with his dangerous existence. The only emotive quality one could seemingly pull from the Wreckage that is grindcore, is the fact that it's going to be an aggressive assault on the sense. Kind of like a smash and grab raid are definitely the epitome of great grindcore. Saws destruction Brain grinding with spark eroding Harmonization Coarse ear! To call this the definitive grindcore would not be a misnomer, as it really fulfills all of the genre's descriptive elements but never feels particularly subject trite. Maybe it's the apocalyptic atmosphere, or perhaps they're MORE brutal and faster than other grindcore bands. Also it could be Because I enjoy the aesthetic grindcore. Especially For Diehard Fans Of Nasum, GREAT GRINDING ASSAULT HAS COME !!! !